Nutrition misinformation and food confusion surrounds today’s health-conscious runners. To arm myself with knowledge to better educate my clients, I (along with 10,000 other registered dietitians) attended the Academy of Nutrition & Dietetics annual convention to learn the latest food and nutrition updates. Here is some information that might help you on your health journey. • Stress fractures are a common sports injury. Among 42 Division-1 cross-country runners, 35% of the male and 41% of the female runners reported having had a stress fracture. Inadequate nutrition could have contributed to the problem. Their diets tended to be low in calories, calcium and/or vitamin D. If you are going to push your body to the limits, at least fuel it optimally! • If intestinal distress sidetracks you during your runs, try reducing your intake of apples, onion, garlic and broccoli —particularly for 2 to 3 days before a competitive event. These are just a few commonly eaten foods that are high in fermentable (gas-producing) carbohydrates; they might contribute to undesired pit stops. You could also meet with a sports dietitian to help you systematically discover triggering foods. The referral network at www.SCANdpg.org can help you find your local sports food expert. • Exercise increases harmful free radicals within muscles that can lead to oxidative damage and inflammation. Should runners supplement with anti-oxidants to counter this? No. The better bet is to let the body adapt to these higher levels (and eat abundant anti-oxidant rich fruits and vegetables). Adaptation creates a change for the better in an athlete’s physiology. • Alcohol contributes to hypoglycemia (low blood glucose) by suppressing the release of glucose from the liver into the blood stream. If a runner hasn’t eaten much food (as can easily happen after a race), alcohol in an empty stomach can easily lead to hypoglycemia (a lack of glucose for the brain) and a drunken stupor. The same happens when a person with diabetes has low blood glucose; he or she can get mistaken for being drunk (when the brain just needs food). 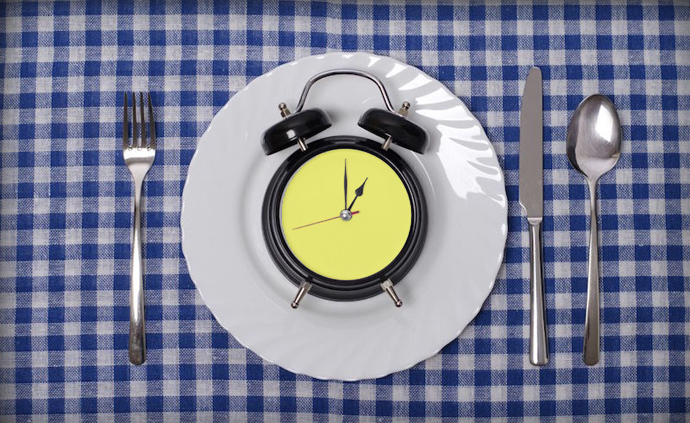 • Meal timing affects circadian rhythms —as well as weight management. A study (Garaulet, 2013) with 420 subjects who ate an early lunch or a later lunch reports the early lunch eaters lost more weight, despite consuming the same number of calories and getting the same amount of sleep. Your best bet is to eat more food earlier in the day. As you have undoubtedly heard before: Eat breakfast like a king, lunch like a prince, dinner like a pauper. • We compromise our well-being every time we have a mis-match between the environment and our internal biological clock. (Think jet lag, shift work, sleep apnea, and watching late-night TV.) Every cell has a biological clock; all these cellular clocks need to be synchronized. If not, bodies become unhealthy. For example, shift workers experience more high blood pressure, heart disease and diabetes than people who work 9:00 to 5:00. For athletes, jet lag means poorer performance. -- avoid caffeine at least 4 hours before bedtime and limit it to 2 mugs (400 mg. caffeine) a day. -- turn off your computer screen/TV an hour before bed. • Consumers are self-defining healthy food: it needs to be organic, natural, non-GMO, free of dyes/additives/ colors, and have a “clean” label with no strange words. Will this trendy definition lead to unintended health consequences as food producers try to meet consumers’ demands? Likely yes. If you make your food decisions based on trends rather than science, you might want to take a step back and look at the whole picture. For example, enriched foods offer added nutrients that can make a label look “dirty” but the extra ingredients are good for your health. Added iron reduces your risk of becoming anemic; folic acid reduces the risk of birth defects; iodine reduces the risk of goiter. Preservatives that have been generally regarded as safe help bread stay fresh for longer, reduce the growth of mold on cheese, and reduce the amount of food you waste. These ingredients can be beneficial for you and for the environment. • Sugar-sweetened beverages are the biggest source of dietary sugar in the US diet. Hence, research on sugar and health has focused on soft drinks. The question remains unanswered: Is sugar added to nourishing foods a health hazard? That is, is sugar added to spaghetti sauce (to make it less acidic) bad for you? What about the sugar added to bread (to help make the dough rise) — Is that a cause for concern? Doubtful. Yet, too many consumers freak out when a product lists sugar on the food label. Please note: sugar is just one of many nutrients listed on the label. Please look at the whole nutrient package. For example, chocolate milk has sugar (that refuels muscles) but it also offers protein (to repair muscles), sodium (to replace sweat loss), calcium & vitamin D to enhance bone health. Dietary guidelines say 10% of total calories can come from added sugar. That’s 200 to 300 calories a day for athletes. Do you really need to freak out about a little sugar that makes that spaghetti sauce taste better? I think you can find bigger things to worry about. Sports nutritionist Nancy Clark MS RD CSSD has a private practice in the Boston-area (Newton; 617-795-1875), where she counsels both fitness exercisers and competitive athletes, teaching them how to eat to win. Her popular Sports Nutrition Guidebook, and food guides for marathoners, cyclists and soccer are available at nancyclarkrd.com. For online workshops, see NutritionSportsExerciseCEUs.com.